Swimwear should always be fun! 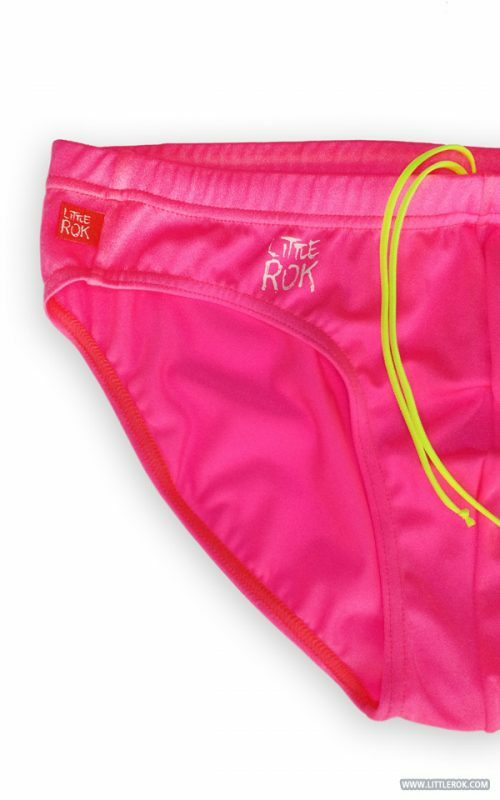 I know not everyone out there will rock this electric pink swim brief on the beach. But, I know many would love this pair and would wear it anywhere. Personally, I think this is an amazing pair of swimwear. Little Rok has been around for a few years and always makes super fun swimwear. The first time I saw them they were making comic inspired briefs (which they still have on their site). But they have some solids that rock. Not every guy wants printed swimwear. Lycra beauty Made in Italy fabric with XtraLife Lycra fiber dyed with a particular fluo dyestuff. Outstanding shaping and comfort that resist suntan lotion, body oils and chlorine. For long-lasting, beautiful shaping. Only Little Rok Original LOGO print on the front and “Little Rok” red flag on the side. To extend the life of your swimwear: rinse with cold water after each use to remove any chlorine, salt water, or lotions. Wash on delicate cycle or handwash only and lay flat to dry. I dare you guys to rock this Pink swim brief this summer. If I get to my 36 waist, I’ll rock one of these! !